Announcement BadgeBlooms ® is the Original Home of the Felt Badge Reel and Creator of the Medical Feltie Badge Clip. We are your source for Floating Locket Badge Reels, Essential Oil Diffuser Badge Reels, Secret Santa, Coworker Gifts, Christmas Gifts for Nurses, Nurses Week Gifts, Flower Badge Reels, Personalized Badge Reels, Bling Badge Reels, Cute Badge Retractors, Retractable ID Badge Pulls, Name Badge Clips, ID Badge Holders, Gifts Under $10, Unique Nurse Gifts, Staff Appreciation Gifts, Coworker Gifts, Holiday Gifts, Teacher Gifts, Graduation Gifts, Birthday Gifts, Secret Santa Gifts, Stocking Stuffers, and Corporate Gifts. Welcome to BadgeBlooms®! 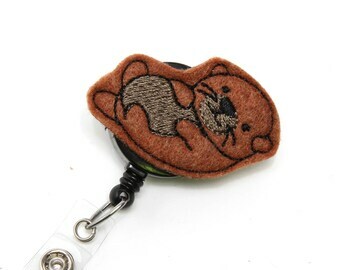 Here you will find cute and decorative retractable ID badge holders with fun embellishments. Each one is uniquely crafted and makes a great gift for yourself or someone else. Medical professionals, hospital staff, physicians, nurses, office workers, teachers, students, cashiers, executives, airline employees, and virtually anyone who wears a name tag love accenting their ID with Badge Blooms®. An array of colors and styles are available to choose from. And, we only use the finest materials such as genuine Swarovski Crystals to embellish our products. All of our designs are made with Swivel Alligator (pinch) Clip Retractable Badge Reels. If you would prefer a Slide Clip Badge Reel instead, simply mention your preference at checkout. Want to purchase multiple BadgeBlooms ® as gifts for your co-workers or employees? We offer discount bundle pricing. Contact me for details about great deals! Reserve your very own BadgeBlooms ® today! BadgeBlooms ® is always one step ahead of the trends so, don't forget to like our Facebook page and follow us on Instagram and Twitter to be the first to see new designs unveiled and for exclusive coupons and giveaways! BadgeBlooms ® is the Original Home of the Felt Badge Reel and Creator of the Medical Feltie Badge Clip. We are your source for Floating Locket Badge Reels, Essential Oil Diffuser Badge Reels, Secret Santa, Coworker Gifts, Christmas Gifts for Nurses, Nurses Week Gifts, Flower Badge Reels, Personalized Badge Reels, Bling Badge Reels, Cute Badge Retractors, Retractable ID Badge Pulls, Name Badge Clips, ID Badge Holders, Gifts Under $10, Unique Nurse Gifts, Staff Appreciation Gifts, Coworker Gifts, Holiday Gifts, Teacher Gifts, Graduation Gifts, Birthday Gifts, Secret Santa Gifts, Stocking Stuffers, and Corporate Gifts. BadgeBlooms®️ is having our 25% OFF Spring SALE! No coupons needed, no minimum purchase required. Perfect time to start Nurses Week gift shopping! Stay tuned for the 200+ new Blooms we’ll list over the next 2 weeks! Visit our FB page for a sneak peek! Visit our IG page and enter our MASSIVE GIVEAWAY for your chance to win all 10 products featured above from the fabulous vendors who have partnered with me for our 90k sale celebration!!! Winner will be chosen Wed 11pm CST! Good luck! . Thank you all! BadgeBlooms® is the original creator of Felt Badge Reels and inventor of the Medical Feltie Badge Reels. BadgeBlooms® has popularized Flower Badge Reels. BadgeBlooms® copyrighted Blossom Bling creations are a hit for appreciation and graduation gifts. And, most recently we have begun creating our own unique graphics. Just as a flower transitions from a bud, my badge reel became an eye catching bloom. Quickly they were noticed, and this is how our online presence began. We've been sharing BadgeBlooms® with our customers since 2011, and continue to grow each year. I am inspired by creating the most stylish and unique decorative badge reels available. I'm sure you'll find them as fun as we do! We are the leading choice for Designer and Decorative ID Badge Reels. Each one is crafted with thoughtfulness of design and color appeal. Every effort is made to ensure quality, and your satisfaction is very important to us! Our listing descriptions and photos are taken to provide you with the most accurate depiction of the product. However, please be aware that monitors and mobile screen settings vary. So, coloring may appear different from one device to the next. If for some reason you are not satisfied with your purchase, please message me so we can discuss. Due to the fragile nature of Locket BadgeBlooms which are made of glass, they can be broken if dropped. We are not able to replace lost charms. Our goal is to make sure you are completely happy with your purchase and visit us again as well as make referrals. We love our customers! If your Badge Bloom happens to arrive damaged, we must be notified within 3 days of delivery of the package. Custom and/or personalized orders cannot be returned/refunded. If you decide to return, we recommend shipping in the original packaging or something as secure, with insurance or at least with a tracking number for your protection as we can only provide a refund if the product makes it back to us and in an undamaged condition. Original shipping charges cannot be refunded, because postage has already been paid to ship the item to you. A 10% restocking fee will be assessed on the item price for all returned products, prior to refund given. We accept PayPal and credit cards via direct checkout on Etsy for all transactions. Once payment is received, your BadgeBloom will be shipped without delay. Your Badge Bloom will be shipped via USPS First Class Mail in a corrugated BOX. We do not ship in padded envelopes or other types of packaging that fail to protect our products from damage while en route to you. As such, we must charge a slightly higher shipping fee to accommodate for the premium packaging supplies. A shipping confirmation and tracking information will be provided both on your Etsy receipt and via email at the address you provided when placing your order. Custom orders are insured. If you need expedited shipping or guaranteed ship by date, please contact me to discuss your specific needs and options. Due to the nature of the postal service, delivery estimates are often incorrect and not guaranteed unless overnight express service is purchased. If you are in need of a guaranteed delivery date, please contact me to arrange shipping upgrade to overnight express (if available). ** International customers are welcome! But, please be aware that transit times for international packages vary greatly from 10 days to sometimes more than 8 weeks. Packages are often held up in customs at certain countries. Once the package leaves the US, we have no control over the package. But, each item is tracked which can be verified with the link on your Etsy receipt. If you would like to insure your International package, contact us about pricing options as this is not an included feature with standard postage. We appreciate your business and believe in rewarding our customers for sharing where they found their BadgeBlooms. For each customer you refer that makes a Badge Bloom purchase, you will receive 10% off toward your next single Badge Bloom Etsy purchase. Referral bonuses do not expire and you can use multiple referral bonuses at once. The person you refer must mention your name at the time of purchase. Once I receive an order from a person you have referred, I will contact you to arrange a coupon code especially for you! You may use it right away or bank them to combine all your referral bonuses. Referral bonuses can only be used one time per referral. Referral bonuses cannot be combined with other types of discounts/coupon codes. Likewise, 2 different types of coupon codes cannot be used at once. However, aside from referral bonuses...I have several ongoing coupon codes and occasional promotion codes ranging from 20-40% off. We also offer 2 for $29 and 3 for $39 promotion listings for purchase, which are most commonly used for our higher-end BadgeBloom products. Bundles and Gift Sets are not eligible for these promotions as they are already priced at a reduced rate. Locket BadgeBlooms and Diffuser BadgeBlooms are also not eligible for these promotions per listing description. Convo me with your requests and bulk orders. We will come up with something you adore at an affordable price! Badge Blooms are constructed with small parts that may pose a choking hazard and therefore should not be played with by children. So, please keep your Badge Bloom safe from the little ones.